2-13-2015 Scarlet Macaws are Left Handed! Who Knew!? Interesting facts about red macaws. Red macaws, or Scarlet Macaws as they are properly named, are birds from the macaw or parrot family. Most of them live in sub-tropical and tropical rainforests and can live up to 70 years in captivity, but only about 30 in the wild. Their feathers show a beautiful combination of yellow, red, blue, white, and green. The best features are along the tail and white bill. They can be found in Central and South America as well as a few other countries. They are mostly bright scarlet red and gather in flocks of up to 30 to 40 individuals. Talk about a family reunion! Some can even mimic the voices of people. ("Polly wants a cracker" isn't the best they can do). From beak to tail they can be as large as 33 inches making them the largest parrots in the world. Now here is some trivia bout them. * They can often be seen on the shoulders of pirates in art. * Their eye color can let you know if they are young or old. * They can measure almost a meter one yard and 3 inches including the tail. * Most scarlet macaws live alone. * Like other parrots, they are actually left handed. Don't forget to go check out the online puzzles you can put together on our Bolivia Puzzles Page where you can find 18 puzzles and new ones being added soon. Here's a question for you. 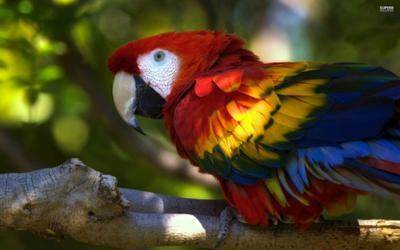 How many names for a macaw can you think of? Until then I want to say thank you very much for reading and I will see you all next time. Bye! Comments for 2-13-2015 Scarlet Macaws are Left Handed! Who Knew!? I've been following the short articles you're posting and I just wanted to congratulate you as you are a very good writer for such a young man. Keep up the good work! I didn't realize they were so big!